Live Processes support exporting process data directly from the Work Portal. This queries the data from the cases or tasks of a given process where the case creation date is withing a defined range of dates. Users with access to the Manage Live Processes Dashboard can be given permission to generate these reports and export them to Excel. This feature is only available for Published processes and takes into account the latest published version of the process for the report's structure. Nonetheless, for transparency and completeness, data from cases created in older versions of a process will be included on reports. To generate Reports a user must be the owner of a Live Process, have the BA Administrator role or have been granted explicit permission to generate Reports. 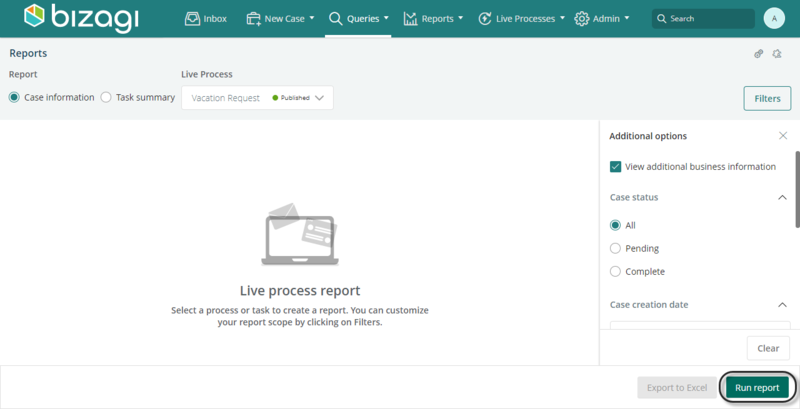 When permission is granted, their Work Portal displays the Live Processes menu with the option Reports. For more information about Live Process permissions visit Granting access to Live Process. For Reports permissions visit Authorizing Reports. There are two different types of reports available: Cases and Tasks. Choose the type of report you wish to generate depending on the level of detail you require. This type of reports yields information about current activities of on going cases. 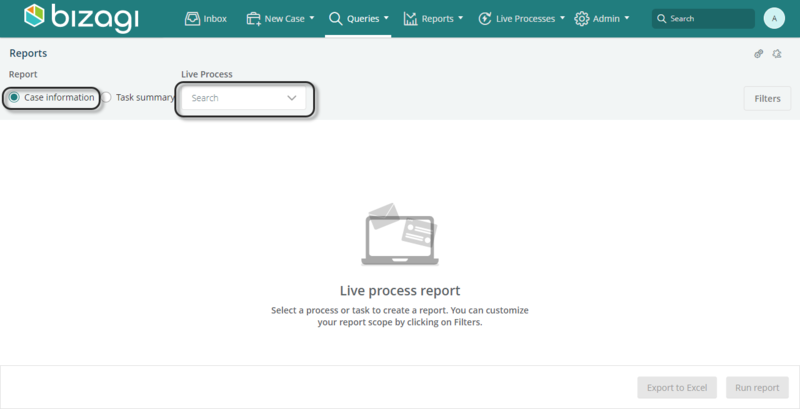 In the Work Portal click the Live Processes menu and select Reports. Alternatively, if the user has permission to Manage Live Processes, a Reports icon is available on their Dashboard. Clicking this button has the same effect as accessing the reports from the Live Processes Menu. When a user clicks the option to access Reports, the window to create reports appears. Reports are generated individually per process. First, chose the Case Information option and the process to get the report form. There is an optional filter available to select a range of date for the creation of the cases. To filter by dates, select the range by clicking the drop-down icon. Finally, obtain the report by clicking the Run Report button located in the lower right corner. 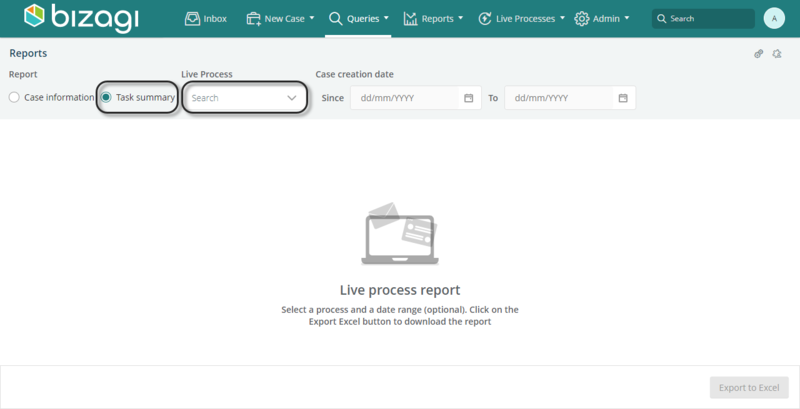 The columns included by default in the report are: Case Number, Case Creator, Case creation date, Case due date, Activity and Current Assignee. The values in Case Id and Activity columns serve as links to the case and the current task respectively. The columns on the right are the supported controls created in the chosen Live Process. Supported controls for reports include: Number, Currency, String, Boolean, Date, Parametric Values, Predefined lists and System entities. The values related to parametric or system entities appear if a display attribute is defined. Attachments, like files or images, and collections are not supported. Reports display the data that has been included in finished tasks. Data in ongoing activities is not included. Users accessing Reports who don't have permission to manage Live Processes, are redirected to a blank Dashboard, with the Reports window closed. In contrast to Cases reports, Task reports offer information about closed activities of cases. 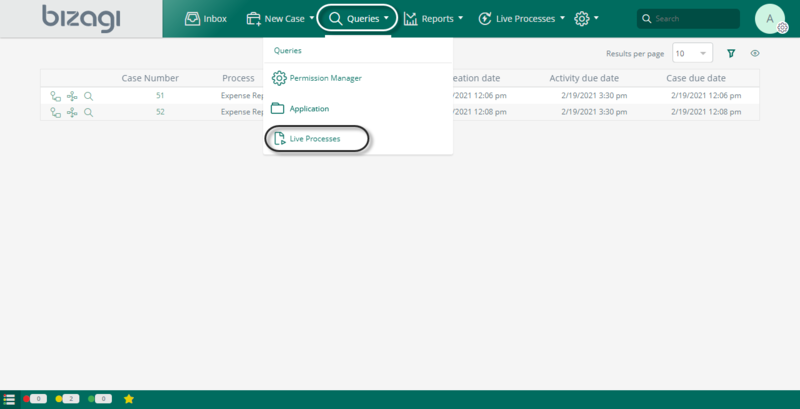 In the report creation window, select the Task Summary option and the process from which you want to create a report. Just as you tailor your report on Cases, select a range of dates by using the date picker controls. Once you have selected all of the filters you need to take into account for your report, click the Export to Excel button. Keep in mind that this type of reports cannot be visualized on the Work Portal, you always need to export them to an Excel file. At this point you are prompted to select a file location and name where your Excel file should be stored. Select the path and input the name that best suits your needs. After that, wait for the download to be completed and open your report.